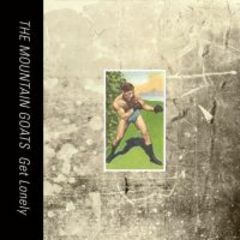 Get lonely is exactly what you will do when you listen to John Darnielle's follow up to 2005's harrowing "The Sunset Tree". Anyone who has ever suffered a painful split from a loved one will find plenty of familiar ground here and anyone who is going through this right now I urge you to steer clear. I listened to this on a drive home one evening and on pulling up to my house I had to shake myself from this dream and remind myself that I was still loved and she was just inside that door. The music here is as sparse and minimal as the moments of joy in Darnielle's life and his falsetto delivery of woe is powerful and crippling. Many of the songs chart the various stages one has to go through after a break-up. "Woke Up New" describes the first morning you wake up alone and how your daily routine is peppered with memories of the person that shared your life. He wanders through the house, lost, and states "an astronaut could have seen the hunger in my eyes from space." In "Half Dead" he throws himself into menial jobs "trying not to get caught, try to think like a machine," he tells himself as he sorts through her old things. "Moon Over Goldsboro" charts that time in the break up recovery when you allow yourself to reminisce about your lost love either thinking you can handle it or knowing you can't but the masochist in you needs the pain. Each memory is followed by the line "Still wake up alone," as if she is following him everywhere like a ghost. But the song that really finishes you off is the title track where Darnielle really sets the scene of a world empty and cold that has no place for you now that you're alone. It features the achingly beautiful line, "and I will get lonely and gasp for air, and send your name up from my lips like a signal flare." Darnielle's emotional power doesn't really come from intricately crafted poetry as it would from Bonnie 'Prince' Billy, but from his simple descriptive lyrics and hushed, delicate singing and although "Get Lonely" navigates very well known waters it does it with heart breaking grace.